I don’t know if this was the best name for the jam. It’s been such an odd summer. Bakingly hot this week, a huge cyclone hitting the country and catastrophic flooding in recent weeks. The middle of the night being woken by the smell of a fire, it’s certainly been an odd summer. Fruit and vegetable prices are set to increase due to the natural disasters effecting so many farmers, so I actually feel kind of lucky to be able to even make this jam. To be in a position to cook up and store some of summers beautiful stone fruit offerings. Eaten mindfully and enjoying every spoonful that’s for sure. Jam really is so easy to make. It’s been said countless times before, but it really is such a great way to preserve the season. Equal parts sugar to fruit, (generally) if needed some pectin of some sort. Cook it up until it thickens and hey presto, done. Cooking at a rolling ball, until cold saucer test stage. In to sterilised jars and store. 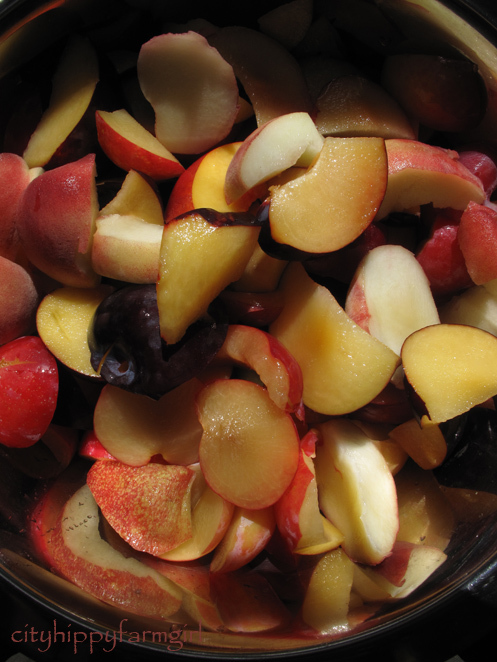 This entry was posted in Food Glorious Food, Going Green and tagged canning, food, homemade, jam, nectarines, peaches, plums, preserving, recipes, slow food, stone fruit, summer by cityhippyfarmgirl. Bookmark the permalink. I make my preserves in my solar oven – takes all the hard work out of it. My prayers are with everyone on the east coast. I’m intrigued by the solar oven, I would love to play one day. That would be great making jam in it! Lovely, Brydie! Adore stone fruit jams of all kinds, and you’re right, it is easy and delicious! Stone fruit jam is great isn’t it. A bit of summer in a jar all through the year. Oh, that looks fabulous and has reminded me that I have some cherries and plums in the fridge that would be just perfect for jam. Oooo, cherry jam! Delicious. Cherry jam daunts me with all those pips, but it would be up there with being a favourite. Natural light and a macro setting Joanna. I’d be lost without them! I haven’t had that many good peaches this year, but the necterines have been pretty good. Oh, yum – fantastic. Nothing says home like home made jam (on home made bread). Oh and by the way – I am glad there were no deaths in the cyclone, but 3 births! I think it says something of the year to come. Happy New Chinese Year of the bunny! 3 births was pretty amazing! Especially to the one that was born in the shelter centre. Pictures of these babes will be much sort after. That is so lovely. You do take marvelous photos- and your jam is making me want some buttered toast and jam right now! Thanks for the sight of summer fruit- I see it in the stores- but out of season is out of my price and comfort zones. I do a lot of jams, but this pectin/no pectin thing gets to me. I don’t like using pectin because of the obscene amounts of sugar required to get a proper set. But then, if you don’t use pectin, you have to cook the jam down, and I think that the longer it cooks, the less real fruit essence and color you have. But recently I realized that if you make a thick pectin freezer jam, it may begin life as more sugar than fruit, but you can keep adding fresh fruit as the jar goes down – I just keep filling it with new crushed fruit, stir it up, and put it back in the fridge for safe keeping. This gives you full, fresh fruit flavor and color, and a nice thick pectin set that lasts quite long. I find that a jar that usually lasts maybe a month or two will stay ‘jammy’ for maybe 6-7 months – and the flavor just keeps getting better! This looks scrumptious! I’ve always wanted to make jam, but for some reason can’t handle knowing how much sugar is going into it! You could do it in a heart beat I’m sure 🙂 Pick an easy fruit, marmalade (if you like it) is a good one to start with (thinking of your seasons atm) equal parts sliced oranges to sugar, cook it up…. Yep. Absolutely the best way to preserve the season, couldn’t agree more. Love stone fruit jams, I’ve been eyeing them off in the markets lately too. I’d love to know more about Dani’s solar oven too…, interesting stuff. I’d love room for a solar oven, sun we have! Oh, yeah…summer in a jar alright! Lovely! I haven’t tried nectarines in jam..must do that! The Monkeys love their banana smoothies they are going to be sadly missed for the rest of the year. It’s a lovely little reminder of warmer times of the year isn’t it. I think Summer Loving jam is the perfect name for this one! I’m about to do the same thing to some plums. Jam it up Amanda. Nothing finer than plum jam, nothing finer indeed. This looks delicious! I bought some pineapple and rosemary jam in Milan the other day. I can’t wait to try it, but I’ll bet it won’t be as good as yours. Australia certainly has been having a hard time of it recently. We heard that the cyclone, luckily wasn’t as bad as people were expecting, but the floods were horrendous. And, as you say, so many crops destroyed too. What was the burning – have you been having bush fires too? 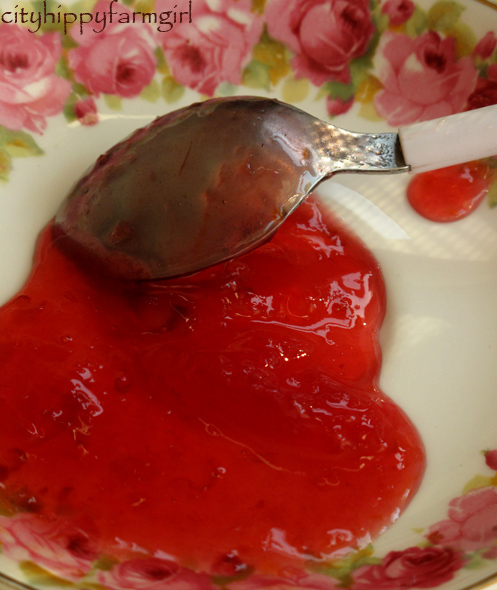 Your jam sounds delicious and looks lovely – I wouldn’t have expected it to be that beautiful red colour – plum skins? There are always a few bushfires about at any one time in summer, the one we were smelling was in the north of the city, in National Park. The jam colour, probably a mix of all the skins, but the plum with the really dark skins and yellower flesh does bring a gorgeous red colour. Very vivid! I’d be curious to know which of the stonefruits dominate in flavour. My pick would be the peach. I must say, I haven’t seen a jam like this one before. Stunning colour. So great. Thanks for your recipe. My children love it so much.